This hit me on Wednesday so I didn’t go out sketching and then about 1pm I had a call from my grand-daughter’s daycare to say she had a high temp. She seemed a little pasty faced and tired when I picked her up but by the end of the day she seemed fine. Yesterday, I was planning to go Pedernales Falls State Park with the Plein group. As it was our watering the garden day, I would arrive late so I just planned to sketch. So organised my bag, switched the water off and locked the doors. Just as I was going out to the garage, the phone went off. It was my eldest daugher, my grand-daughter had been sick this time plus she had a temp of 101f again (it had been normal at breakfast time). She was busy with a meeting so could I pick her up while she arranged things with her boss. Of course I said yes and I also said to continue with her work. So that was my day, looking after my grand-daughter. At first she was very listless as you would be if you felt sick and had a temperature but as the day went on she started to perk up. 3yrs olds never stay sick too long, thankfully, so we had another wonderful day together. 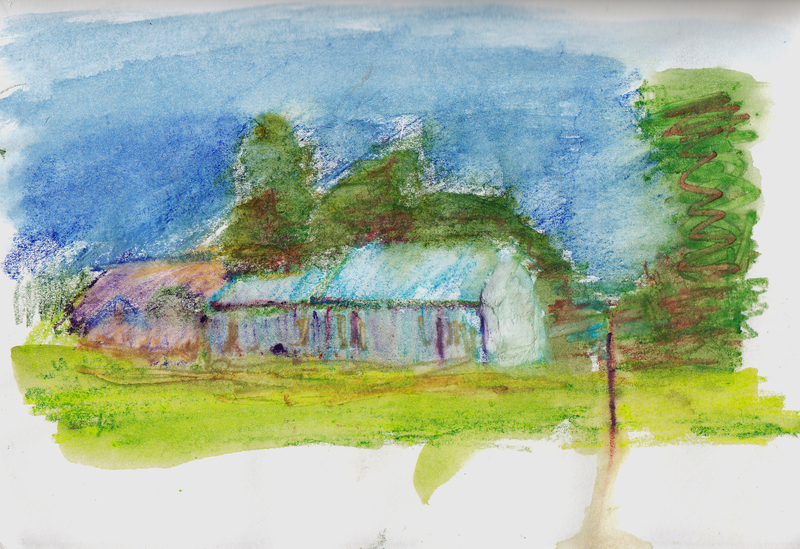 However, that meant sketching was on the back burner for the day or at least I thought so until Gordon suggested going up to Pflugerville Lake with him. Gordon has a pretty set routine and Thursday night is when he runs around Pflugerville Lake. It is just shy of 3 miles, so it takes him about 24-26 mins depending on other factors. So my sketch had to be quick. It was also late, later than normal and the sun was already setting when we arrived, so it was about 8.05. I forgot to take my stool and there are few benches around. As it had been raining earlier I was not keen on sitting on the grass. All the fishing piers had been taken up by fisherman. So looking around I thought ‘ah, the limestone blocks that line the parking area would be ideal.’ I was going to sit on one but ended up standing while resting my pencils on one. Like the other day I used the Derwent Aqua pencils. No graphite drawing to begin with, I just dived in with colour due to the time limits and fading light. Gordon completed his run in 24.32 mins, so this sketch was done in about 15 mins after all the mucking around. Managed some notes at the end when I got back to the car. ‘sketch 11 21st August time 8.32 Drawing complete. Today I was going to go the Falls to meet up with a few member of the group who couldn’t make it yesterday. However, it has been very overcast with a threat of showers. Sure enough, at about 8.45 this morning, we had a brief shower. Houston is getting a lot of rain at the moment (which were the showers are coming from) but apparently most of it will not get here. So maybe this afternoon I can get out and sketch. I like the way your sketching is developing. Working outside does present a lot of challenges that working inside doesn’t.